ZOTAC® supercharges energy-efficient computing with the new ZBOX Blu-ray AD03 series powered by the AMD E-350 APU platform. The ZOTAC® ZBOX Blu-ray AD03 series combines discrete-class graphics processing with a dual processor cores for the perfect synergy of CPU and GPU that delivers a perfect digital media experience with unprecedented energy-efficiency. AMD Radeon™ HD 6310 discrete-class graphics processing takes charge of all digital media processing tasks to enable the ZOTAC® ZBOX Blu-ray AD03 series to deliver stunning Blu-ray and smooth streaming high-definition video playback. The ZOTAC® ZBOX Blu-ray AD03 series is a potent casual gaming platform capable of rendering stunning 3D visuals with Microsoft® DirectX® 11 technology. “The AMD E-350 APU platform combined with our ZBOX Blu-ray form factor is a phenomenal small form factor solution. The snappy day-to-day performance and superb high-definition video and DirectX® 11 3D capabilities makes the ZBOX Blu-ray AD03 perfect for users that crave energy-efficiency without sacrificing premium features and capabilities,” said Carsten Berger, marketing director, ZOTAC® International. Enhanced audio output capabilities deliver superior audio quality and features with the ZOTAC® ZBOX Blu-ray AD03 series. The ZOTAC® ZBOX Blu-ray AD03 series can send raw lossless (bitstream) audio formats – Dolby® TrueHD™ and DTS-HD™ Master Audio – via HDMI to digital home theatre receivers for flawless high-definition audio that matches the high-definition video capabilities. 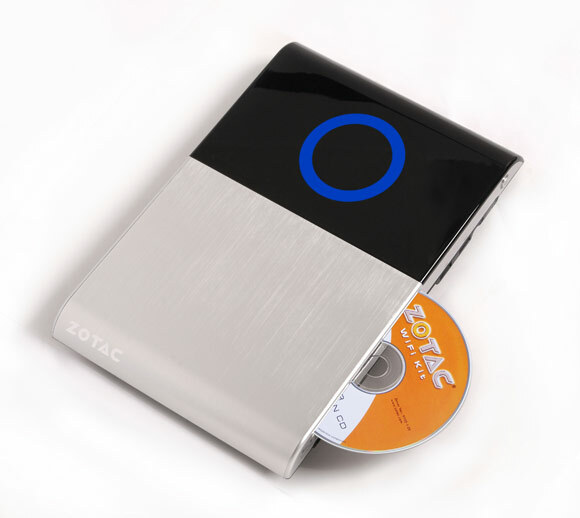 An integrated slot-load Blu-ray drive enables the ZOTAC® ZBOX Blu-ray AD03 series to read Blu-ray media, read and write DVD and CD media for compatibility with all available forms of optical media. Dual network connectivity options lets the ZOTAC® ZBOX Blu-ray AD03 connect to home networks at speeds up to 300 Mb/s wirelessly or up to 1000 Mb/s via Ethernet for lightning-fast transfer speeds with or without wires. The ZOTAC® ZBOX Blu-ray AD03 packs class-leading expansion capabilities inside a slim chassis and provides support for a 2.5-inch SATA HDD or SSD, two DDR3 SO-DIMM slots, mini-PCI express, USB 3.0, USB 2.0 and eSATA expansion capabilities – ZBOX Blu-ray AD03 Plus models include 2GB of DDR3 memory and a 250GB HDD preinstalled. It’s time to play with the ZOTAC® ZBOX Blu-ray AD03 series.